Today is the first day of Fall. At least that is what I am told. We sort of have to fake it around these parts, and convince ourselves Fall has arrived; pumpkin flavored everythings, soups, caramels and apple spice…you get the picture. One of my all time favorite comfort meals for this time of year is a good bowl of hearty, thick, meaty chili. There are maybe three dishes in this whole world that I am told I make better than my mom. This chili is one of them. My mom is a seriously great cook, and so for anyone in our family to tell me I make the better chili, means a ton to me. I love that with chili, you can add and take away pretty much anything you like. I use 93% lean beef, but you could swap for turkey, or forgo meat altogether! Add beans, or don’t. That’s my favorite part about a pot of chili, you can pretty much make a new bowl each time! Over the years I have learned to lovingly perfect this one pot wonder with one simple tip: time. Just like a good tomato sauce, the longer this pot boils, and then simmers, the thicker and more flavorful it will be. That and a bit of tomato paste. The first few times I made chili on my own, the consistency was almost too soupy. The paste helps to thicken and flavor. Two for the price of one, cha-ching. Patience, pet. I promise this will be worth it, in the end. And your house will smell wonderful; another Florida Fall Fake-Out. To a non stick skillet, spray non stick cooking spray. Add onion, garlic cloves, and bell pepper. Saute until soft and lightly browned. Add beef and saute until browned. Add all spices, excluding bay leaves, to meat/veggie combo and mix in pan. To a large pot add crushed tomatoes, tomato sauce, corn, bay leaves, and kidney beans. Allow to come to a boil. Add meat mixture and 3 oz of tomato paste. Simmer on low, about two hours. Remove from heat and allow slight cool. Garnish and enjoy! Makes approx 7 bowls at 1 1/2 cups, each. See what other great Fall recipes are cooking, this week! It’s funny how chili is so different every time–last week I accidentally made the best chili ever, first by over-spicing it with chipotle chili paste, then having to temper the heat with a little nut butter of all things! Who knew? Yours looks amazing–can’t wait to try it! 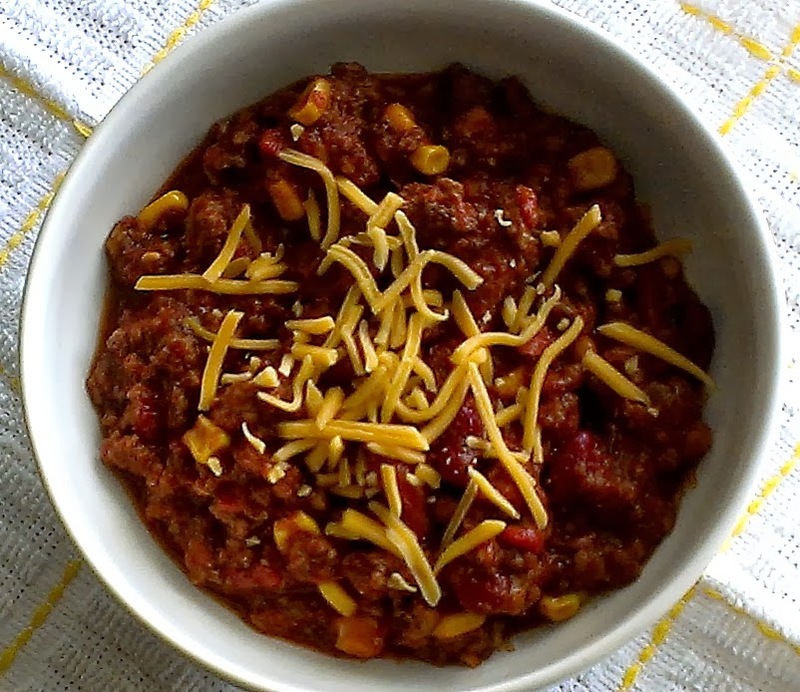 Just looking at these photos of your thick, hearty, comforting chili makes me feel all warm ‘n cozy inside! I wish I were at home in my pjs with a big bowl of this, especially since it’s so dark, grey ‘n rainy out. Oh yes. Nothing beats a big pot of chili, slow simmering on the stove all day. Well, nothing except eating it! 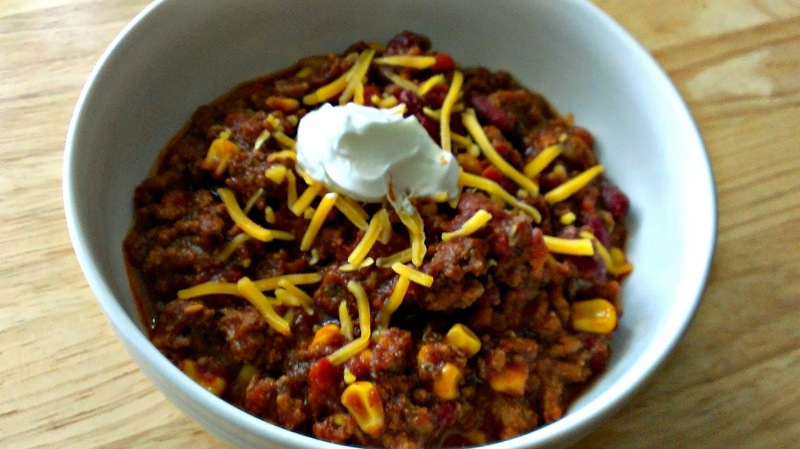 MMM…love chili and yours looks fantastic! 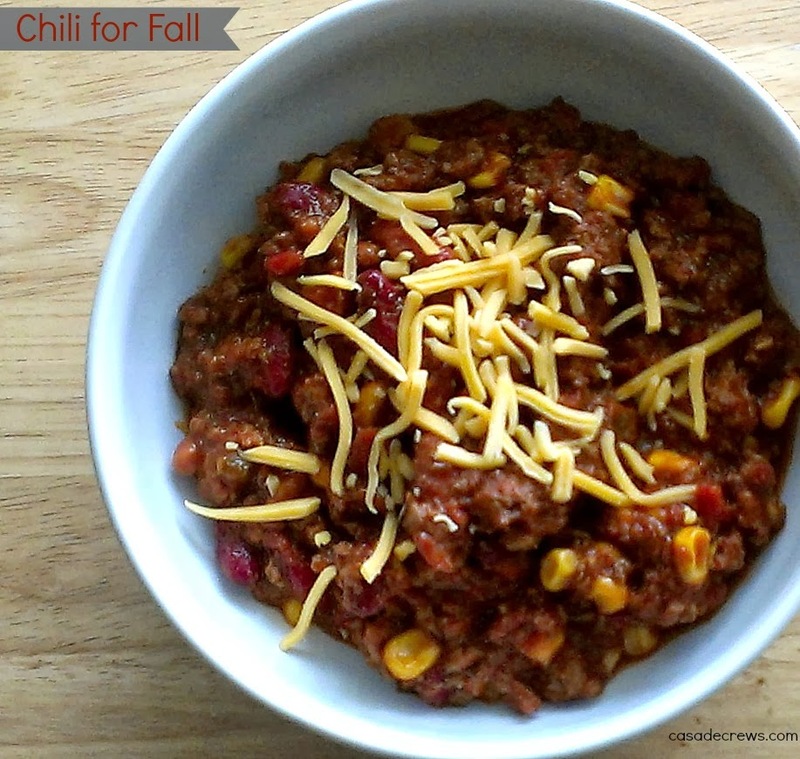 Chili is one of my favorite fall foods! Thanks for sharing! I just had some chili last night, but doesn’t sound half as good as yours! I’ll definitely have to try this! And thanks for adding all those links too, lots of great ideas here! Chili is always such a hit here! My husband loves it! He’ll love this recipe! This chili looks soooo good! I’m giving the weather a few more weeks to officially cool off because I whip up a big pot of chili! This recipe is definitely going on this list! I’m into soup every week for lunches now! I love fall foods. Casseroles too. Chili will be on my list soon I’m sure. I just love chili! So a great, warm and comforting dish!!! Your looks fantastic!!!!!!! Fall is when I drag out my slow cooker and make chili! We’re having a get together soon and am thinking of doing chili with fixins. Your chili looks awesome! That’s a good looking chili! And thanks for the list of recipes, maybe I can finally get my meal planning done ahead of time. I’m a chili fiend, and I love the chunks of veggies in your’s. I hate chili with no veggies. I’ll be coming over for a big bowl! I am so ready for Chili… we usually start making it towards the end of September once or twice before Halloween and then Halloween night we make a HUGE hUGE pot of it and sit around the fire pit handing out candy. Your chili makes me SO ready! I love a good bowl of chili when the weather finally turns! I’m in need of a good chili recipe for my hubby who asks for it all the time…will pin this for one of those days! Delish! Fun fact: My chili recipe won “best all-american chili” in a contest a few weeks ago when my friend made it. It’s a lot like yours! I was going to make chili today, which is ironic, but I think I’ll go the chicken soup route. It’s 45* this morning!